U.S. HIgh Court Ruling Opens Door to New Appeal by Mumia Abu-Jamal of His 1982 Conviction - This Can't Be Happening! One unintended consequence of the recent U.S. Supreme Court ruling in a death penalty case that rebuked actions of a Pennsylvania Supreme Court justice and prosecutors in Philadelphia for conflict of interest was to possibly open a new avenue for activist-journalist Mumia Abu-Jamal to appeal his own 1982 murder conviction because his appellate proceedings were tainted by alarmingly similar conflict of interest, involving the same appellate jurist who was a former DA. That ruling by America’s highest court sharply criticized former Chief Justice of Pennsylvania’s Supreme Court Ronald Castille for his participation in a 2014 death penalty deliberation because that justice had approved seeking that ultimate penalty when he served as the District Attorney of Philadelphia before becoming a state supreme court member. That U.S. Supreme Court rebuke cited judicial conduct rules in Pennsylvania applicable to judges who had previously worked for a governmental agency like a District Attorney. Those conduct rules urged judges to remove themselves from “a proceeding if [their] impartiality might reasonably be questioned” because of their former position with such a governmental agency. Paris protestors for 21 years have held demonstrations monthly to criticize the lack of impartiality by judges in Pennsylvania, particularly judges once employed as prosecutors and/or in law enforcement. Those protestors have also condemned misconduct by prosecutors in Philadelphia like prosecutors unlawfully withholding evidence favorable to defendants. Paris resident Jacques Lederer, 82, has participated in each of those protests held since June 1995. Those protests, staged near the U.S. Embassy in Paris, took place weekly until two years ago when the protests shifted to once a month. “I think the U.S. justice system is slowly changing…I hope in a good direction,” Lederer said earlier this year. The latest ruling by the US Supreme Court vindicates that hope. The U.S. Supreme Court ruled that the participation of former Pennsylvania Chief Justice Ron Castille in that 2014 decision which reinstated a death sentence violated both the constitutional protections of the death row inmate and ethical conduct rules for judges. Castille had rejected the inmate’s request to recuse (remove) himself from participation in the inmate’s appeal that challenged gross misconduct by prosecutors who had worked for Castille himself when he was serving as Philadelphia’s District Attorney. A Philadelphia judge had voided the death sentence of inmate Terrance Williams due largely to prosecutorial misconduct -– withholding evidence favorable to Williams during his trial. But the state’s high court reinstated Williams’ death sentence in that 2014 ruling that included participation by Castille. That 2014 ruling essentially whitewashed the prosecutorial misconduct issue. During Williams’ original trial, prosecutors working under Castille withheld evidence that Williams had been sexually abused by the man he murdered in 1984. Prosecutors falsely told jurors that the murder was simply a robbery gone awry. Some jurors later said that would not have approved a death sentence for the then 18-year-old Williams had they known of the victim’s repeated sexual abuse of Williams that began when Williams was only 15. 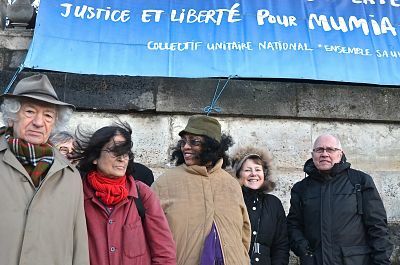 In Paris for the past two decades protestors have staged demonstrations that specifically criticize a litany of alleged misconduct by judges and prosecutors in the murder case of Mumia Abu-Jamal, the author/activist viewed by millions around the world as a victim of a wrongful conviction. During Abu-Jamal’s trial Philadelphia prosecutors, as in the Terrance Williams trial, withheld important evidence favorable to the defense and made secret deals with prosecution witnesses, encouraging some to offer perjured testimony. The connection between the recent U.S. Supreme Court ruling in the Williams case and the Abu-Jamal case is Ronald Castille, the Philadelphia DA turned state Supreme Court justice. While Castile was not DA during Abu-Jamal’s trial, during his stint as Philadelphia DA a few years later, he approved that office’s legal arguments against Abu-Jamal’s first appeal of his conviction. Then later, during Castille’s tenure on Pennsylvania’s highest court he rejected a recusal request by Abu-Jamal’s atttorneys during a critical post-conviction act (PCRA) appeal by Abu-Jamal. During that PCRA hearing, Abu-Jamal’s attorneys argued and presented witnesses who exposed misconduct by Philadelphia prosecutors during Abu-Jamal’s original 1982 trial and as well as offering evidence of misconduct by the Philadelphia judge who presided over both Abu-Jamal’s trial and that crucial 1995 post-conviction appeal itself. Castille, in the appeals from both Abu-Jamal and Williams, issued written defenses of his refusal to recuse himself that castigated both inmates for daring to question his role as a former District Attorney. Castille, in defense of his refusal to recuse himself in both the Abu-Jamal and Williams appeals, claimed he played only a minor role in the respective cases handled by his subordinate prosecutors. Castille framed his participation in the Abu-Jamal appeal and Williams’ trial as merely administrative: signing his name to court documents as the top administrator yet knowing none of facts about the respective cases. Castille’s proclaimed defense of arguing he played just a minor role in death penalty cases contradicted the posture he presented when he campaigned successfully for seat on the Pennsylvania Supreme Court in the early 1990s as a ‘hands-on, tough-on-crime’ prosecutor. Castille, in his written 1998 opinion that rejected recusal in Abu-Jamal’s appeal, also included a startling detail that trashed constitutional equal justice protections. One claim made by Abu-Jamal was that Castille’s participation in that appeal violated the appearance of impartiality required for judges because Castille has received avid political and financial support from Philadelphia’s police union, the Fraternal Order of Police. The FOP is the entity that has strenuously sought Abu-Jamal’s execution for killing a Philadelphia policeman in 1981. In rebutting Abu-Jamal’s contention that police union support corrupted the appearance of impartiality, Castille revealed the damning detail that four other members of the seven-member state supreme court at the time had also received FOP support during their elections to the high court. Castille claimed it was unfair for him to recuse himself when recusal was not requested of those four other members. Castille’s claimed victimhood omitted the salient context that none of those four court members had served as DA of Philadelphia and none personally approved opposition to Abu-Jamal’s appeals. Philadelphia FOP campaign support for and special union awards to five members of the state Supreme Court that unanimously rejected Abu-Jamal’s appeal in 1998 certainly tainted that “appearance and reality of impartial justice” standard professed in the U.S. Supreme Court’s recent Williams ruling. The U.S. Supreme Court upheld the Pennsylvania Supreme Court’s 1998 rejection of Abu-Jamal’s appeal. America’s highest court in that ruling whitewashed the unethical participation of Castille and the documented pro-prosecution bias of the PCRA judge, Albert Sabo when it upheld the actions of Castille and his confederates. Sabo’s disdainful antics against Abu-Jamal’s defense team during his 1995 PCRA were so egregious they drew wide rebuke from the news media, including Philadelphia-based columnists and editorial writers who had earlier dismissed any claims that Sabo was biased against Abu-Jamal. It remains to be seen whether the “Mumia Exception” continues, again blocking his benefit from rulings that overturn other state convicts’ convictions. Will that unlawful “Mumia Exception” finally cease, permitting Abu-Jamal to obtain justice from this latest U.S. Supreme Court precedent?